Welcome to Alaska’s Ridgewood Wilderness Lodge, a premier Alaska eco-tours destination. At the Ridgewood, you will have a true Alaskan experience. Alaska’s Ridgewood Wilderness Lodge is the vacation gateway to the Kenai Peninsula’s 150,000 sq. miles of extraordinary excitement and adventure. Whether you come to enjoy the incredible views of mountains and coastline, to experience the thrill of kayaking amongst icebergs, hiking to a glacier, world-class halibut fishing or Alaska bear viewing, there is something for everyone here. Even Alaskans vacation to this part of the state to remind themselves of why they moved to Alaska in the first place. Glacier paddling, otters, birds, Alaska, Halibut Cove and many new plants and experiences. Thank you to our wonderful hosts here at the lodge. Great food and sweet, sweet air too. "Your home is wonderful, and this week has been filled with wonders. Every day was filled with new adventures in a setting I felt so at home in. Thank you so much!" Our eco-lodge is located on the Kenai Peninsula. This region is 90% wilderness and therefore presents critical habitat for viewing and observing a variety of wildlife in a natural setting. The Kenai National Wildlife Refuge is a sanctuary that encompasses one third of the Kenai Peninsula and provides habitat for moose, bear, wolves, sheep, goats, caribou and much more. Perhaps it is best noted for its coastline which is prime for viewing a vast variety of marine life, and Kachemak Bay is noteworthy for its world class birding. Kachemak Bay is also the final destination for tens of thousands of salmon which instinctually come here to complete their life cycle. As a result, many opportunities are afforded to fish for them, as well as halibut, dolly varden trout, and rainbow trout. Alaska’s Ridgewood Wilderness Lodge is located adjacent to the Kachemak Bay State Park and Kachemak Bay Wilderness Park. This magical part of the Peninsula offers more than just majestic scenery, glaciers and wild rivers. Few places in the world can boast such a unique blend of wilderness, wildlife viewing, and adventure for your Alaska vacation. Alaska's Ridgewood Wilderness Lodge is especially recognized for high quality and authentic Alaska adventures which showcase the best Alaska has to offer. Please note that as we are located on an island, all of the activities we offer require a short boat ride to the Kachemak Bay State Park. We offer multi-day vacations that are stand alone experiences. We recommend several days to enjoy everything we have to offer, and if you don’t see a tour that you’re interested in, please give us a call. Here at the Ridgewood you won’t be just looking at Alaska, you will be immersed in it! Our experienced guides will accompany you on all of our in-house activities. As an Eco Lodge, Alaska's Ridgewood was designed to be in harmony with the surrounding environment. We take pride in the fact that our guides are Alaskans, we utilize our local businesses and Farmer's Markets, we maintain a large vegetable garden, and support our local environmental organizations. We are situated in a semi-remote location, adjacent to the Kachemak Bay State Park, but we did not sacrifice luxury or comfort for your Alaska Vacation. We have preserved as much native vegetation surrounding our property as possible enhancing and conserving the local ecology. We have reincorporated trees and shrubs that will encourage birds and other wildlife to nest and rest here. Our facility was designed and planned carefully. All of our appliances are modern and were selected for their energy efficiency. We do not use bleach or other harmful chemicals and all of our soaps and detergents are either hand-made here at the Ridgewood, or purchased from an Eco-friendly company. The largest challenge facing remote Eco Lodges is how to deal with all of the water borne waste, before it is discharged into the environment, in an ecologically friendly way. Your health and safety is important to us, and with this in mind, our system was designed by experts in their field and approved by The Alaska Department of Environmental Conservation. Our philosophy even extends to our oyster farm. With the cooperation of the Alaska Department of Environmental Conservation and other local oyster farmers, together we sponsor an annual program designed to certify and guarantee the quality of the water. This is accomplished by taking water samples and tissue samples of wild mollusks five times annually. Our oysters are also tested weekly from May 1st through October, and monthly from November 1st through April. These farms are considered in the environmental community as “the canary in the coal mine”. In summary these oyster farms are a valuable addition to the local eco system. Many visitors to Alaska come for the unique experience of bear viewing. To see a brown or black bear up close in the wild is truly exhilarating. This six hour tour is included in your stay at the Ridgewood. You will love this land and sea wildlife tour of the area. Seeing Alaska by air is unforgettable. 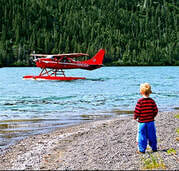 Our guests have the option, for an additional charge, of booking a scenic flight to round out their Alaskan stay. An Alaskan vacation wouldn’t be complete without exploring the marine and coastal wildlife by kayak. With over 400,00 acres of the Kachemak Bay State Park right out our back door, there are endless trails and mountains to be explored. Hiking to Grewingk Glacier is always a highlight! 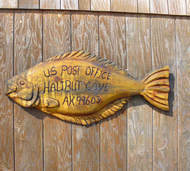 Fishing in Alaska is arguably the most popular activity for both visitors and resident Alaskans alike. Enjoy catching salmon, halibut, and rockfish. A day on the water is not soon forgotten.